And it is another t! I decided I needed a good raglan pattern, so I copied an existing t to give it a try. I didn’t want to ruin any of my new Girl Charlee knit fabric** so I dug some cotton Lycra out of my stash. The Lycra is a little stiff (I want something a bit more drapey), but by jove I think I am happy with the pattern! **Full disclosure: that link goes to the account setup page, which has a referral code. If you don’t want to do it, no biggie! Cool. You did a pretty good job of matching up the striping on the raglan sleeves too! you are cracking me up, I do not know the last time I heard someone say “by jove”! 😉 The new T looks great tho!!!! I really like those sleeves! I like that raglan tee! I may just have to make one too…since I’m on a tee binge lately. Great nail color too btw. Hi Mariko, it’s a very cool Tee! 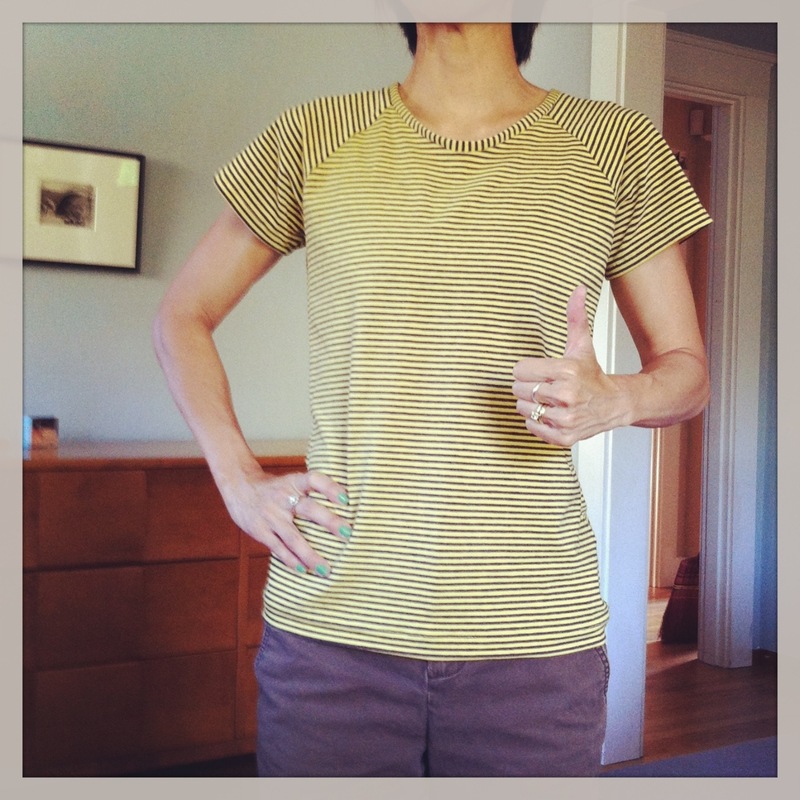 I am being amazed with the beautiful stripe matching. By the way, I’ve sent you a Flickr mail. Could you please check it out? Thank you! Nice T-shirt! I enjoy reading your blog and seeing the great knitwear you sew. Thanks for the Girl Charlee link. I signed up using your referral code.